Host a party and serve Chicken Salsa Verde Tamales. Slow cooker filling recipe with simple ingredients. Fast freezer meal for busy holidays and gatherings! Chicken Salsa Verde Tamales are small, fluffy, with plenty of filling in every bite….oh and the bite of the gooey cheese! Yummy!! I used Oaxaca and Queso Fresco cheese, you can find these in most grocery stores or Monterey Jack cheese works and is very tasty. Tamales do take time, but the process is one to enjoy and share with friends or family. Let’s talk about Tamales, answer your questions, and get you wrapping these fantastic classic Mexican treat! Living in Southern California, I grew up with Mexican Cuisine inspiration so each Christmas tamales are now on my “It won’t seem like Christmas without” list. Sure we can buy tamales, but this year I am sharing my filling recipe for Chicken Salsa Verde Tamales and the best part is that you can use a…wait for it….a slow cooker!!! YAY!! See this really isn’t that scary now, is it? Come on let’s make some tamales, give some, eat some, and freeze for days ahead when you don’t want to cook! My husband Anthony has a family tradition to eat tamales on Christmas Day, so a few years back I made the bold decision to learn to make them with my daughter Bridgette and bring my “A game” for the family. Guess what…they are worth the effort! To start the tamale-making-tradition in your home, invite family and friends and host a tamale making party otherwise known as Tamalada! As the host, you can make all the ingredients or ask people to bring things to the party. Heck, they can also bring drinks and appetizers! Be sure to soak the corn husks, and mix the drinks. Some fun drinks to serve: Micheladas, Margaritas, Mexican Beer, or Mexican Hot Chocolate. Show your guests or family how to fill and wrap the tamales, and your Tamalada Party is started! I have tried several tamale filling recipes over the past few years. Using the slow cooker is an easy way to prepare the filling and save time. Another shortcut, buy the masa fresh from a Latin grocery store. You can make your own masa dough, the recipe below is really easy and came from Sunset Magazine December 2014 issue. The link below to the article has several filling recipes, tips and ideas to make perfect tamales. Here is the link: Basic Tamale Method. These recipes are from Cookbook author Marcela Valladolid. Tips: Masa keeps up to 3 days chilled and airtight. Soaked corn husks, up to 2 days, chilled in ziplock bags. Cooked tamales keep for 1 week chilled and up to 2 months frozen. To reheat, steam or microwave, covered with a damp kitchen towel. In a slow cooker, add onion, all spices, and stir. Put chicken breasts with a jar of Salsa Verde sauce in slow cooker. Cook on High for 3-4 hours until chicken is fork tender and shreds easily. Transfer the cooked chicken breasts in stand mixture or with a hand mixer. Place shredded chicken back into liquid in slow cooker. This filling is ready to use, or refrigerate for up to 2 days. Green and Red Salsas to drizzle over steamed tamales. I bought these at Albertsons in Southern California. Roasted Salsa Verde is used in the recipe for the filling. Available at Costco. Soak corn husks: Submerge in hot water, weighted down with a plate, until pliable, about 30 minutes. You'll have extra, but that's good; invariably some rip or are too rigid to fold properly. Small sections can be wrapped around split ones. 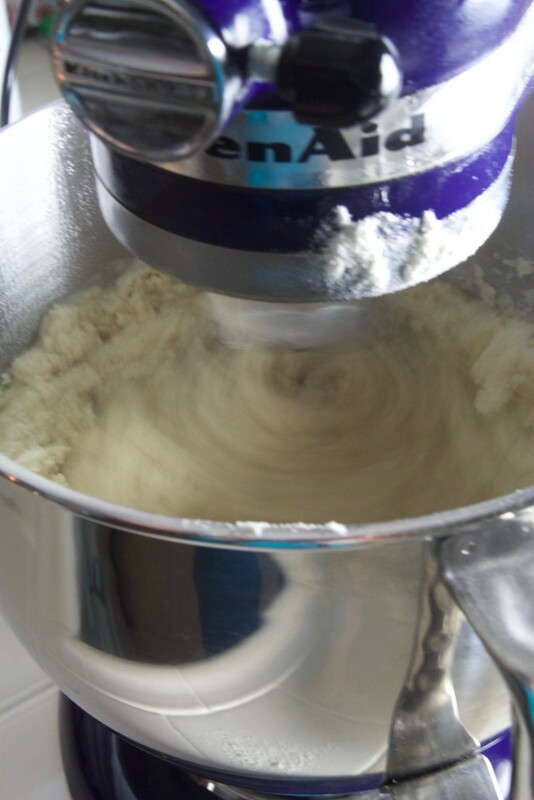 Make masa dough: Using a mixer with the whisk attachment, whip lard on low-speed, then increase to high, until lard is as fluffy as frosting, about 5 minutes. 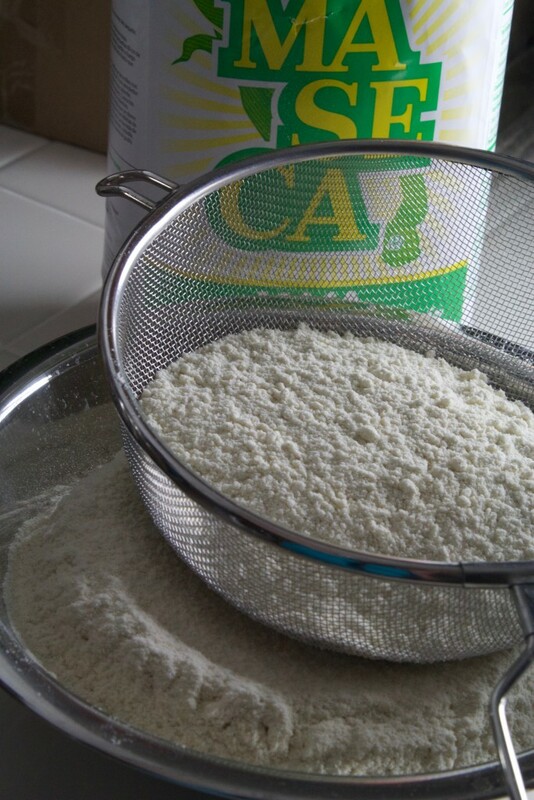 Put masa harina in a large bowl, sift in baking powder, and whisk in salt. With a mixer on low-speed, beat one-third of masa mixture into lard until fully incorporated (scrape beater and bowl at least once), then beat in one-third more. With mixer still on low, drizzle in broth so it doesn't splatter, and beat 5 minutes to hydrate masa mixture (it will thicken). Beat in remaining one-third masa mixture, a spoonful at a time, until incorporated and the dough is soft and fluffy without being sticky (you may not need all the masa mixture). Test the dough by rolling a small ball of it over the back of your hand; if it rolls easily, without sticking, you've added enough. Cover dough with a damp kitchen towel and let rest for at least 10 minutes and up to 1 hour, or chill up to 2 days. Meanwhile, drain cornhusks and pat dry with a kitchen towel. If you won't be using them immediately, chill them in resealable plastic bags for up to 2 days. Fill tamales: Set a cornhusk on a work surface, smoother side up (or hold it in your hand), and Set a corn husk on a work surface, smoother side up (or hold it in your hand), and use a pastry bench scraper to smooth the masa onto the corn husks. Wrapping Tamales: Step 2: Spread a layer of Chicken Salsa Verde Tamale filling and a nice big piece of cheese, now you are ready to start wrapping. Step 3: Place the point away from me, and roll the first side over the filling 1/2 way, fold up the point tip end, and then roll over to seam side down. Slip string under tamale and tie with a 16" piece of string in a bow. 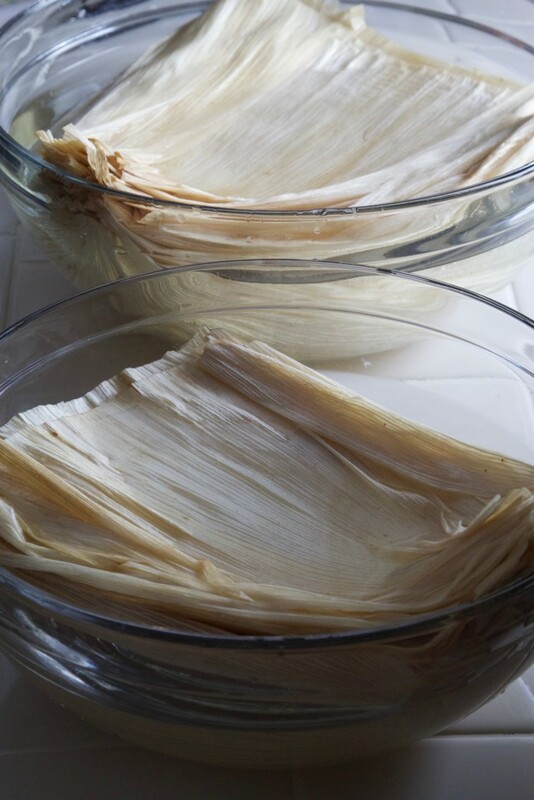 As you work, set wrapped tamales upright (open ends up) in steamer baskets of pots, packing them loosely. Steam Tamales: Place a steamer basket in the bottom of a large stockpot, fill water just to the base of where tamales are placed, you don't want the water on the tamales. Place a tight-fitting lid and steam for 1 hour. Tamalera pots are available just to steam tamales. Bring water to a boil and then reduce heat to medium-low for 1 hour. Add additional water as needed. Remove the string and corn husks, and top with your favorite salsa. Nutrition information is for calculated without separate filling. Vegetable Shortening or Lard: Widely available, vegetable shorting like crisco will work in these recipes. But for tamales with the best flavor and lightest texture (and no trans fats), get fresh lard from a butcher shop or Latino market. Masa harina: Masa harina is fresh corn dough dried and ground into flour; to use, mix with lard or butter, baking powder, and broth or other liquid. Brands vary in texture; Maseca was used in this recipe, since it’s easy to find. Or, choose fresh masa, which you can use as is; look for the label “para tamales” at a Latino market. You’ll need 4 lbs. for 3 dozen tamales. Please note that some of the links in this post are affiliate links and guess what? If you these click them and purchase, it might link to Amazon who will give me a commission if you buy from their site. In other words, I might get paid if you click on that link. And the reason I’m telling you this is because I want to be up front with you, and because it’s illegal not to tell you. If I have used a specific product, love, and highly recommend it, I will share that in a post with my experience as a helpful kitchen tool or ingredient for your cooking! 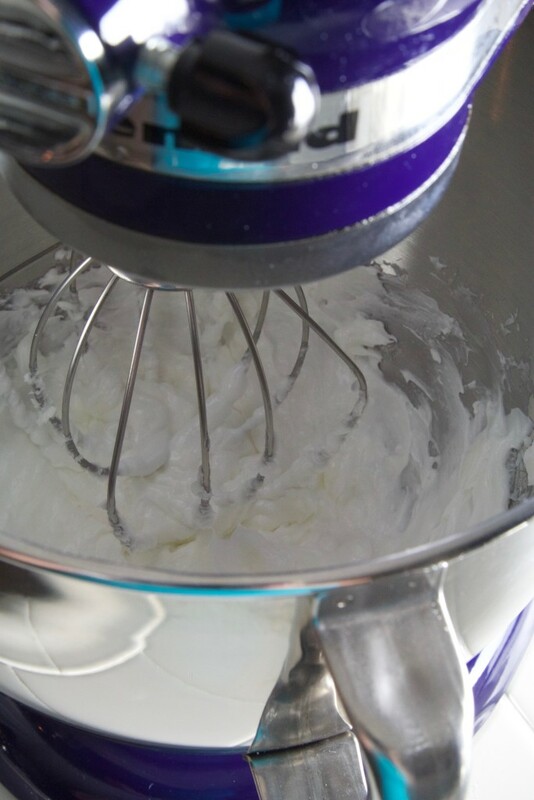 Using a Kitchen Aid stand mixer with the whisk attachment, whip lard on low-speed, then increase to high, until lard is as fluffy as frosting, about 5 minutes. Put masa harina in a large bowl, sift in baking powder, and whisk in salt. With mixer on low-speed, beat one-third of masa mixture into lard until fully incorporated (scrape beater and bowl at least once), then beat in one-third more. With mixer still on low, drizzle in broth so it doesn’t splatter, and beat 5 minutes to hydrate masa mixture (it will thicken). Beat in remaining one-third masa mixture, a spoonful at a time, until incorporated and dough is soft and fluffy without being sticky (you may not need all the masa mixture). Test dough by rolling a small ball of it over the back of your hand; if it rolls easily, without sticking, you’ve added enough. In a slow cooker, (my favorite is the Cuisinart Multi-Slow Cooker) add onion, all spices and stir. Put chicken breasts with jar of Salsa Verde sauce in slow cooker. Cook on High for 3-4 hours until chicken in fork tender and shreds easily. Use a stand or hand mixer to shred the chicken, it works so well and is so much faster than shredding by fork. Put the shredded chicken back into slow cooker to mix with liquid and keep it moist. This filling is ready to use, or refrigerate for up to 2 days. Extra can be frozen and used for tacos or enchiladas. Prepare corn husks: Find bags of husks at Latino markets, well-stocked grocery stores, and online at mexgrocer.com. Choose husks that look fresh and smell sweet. Soak in bowls of warm water for 1 hour, weigh down with plates. Drain corn husks and pat dry with a kitchen towel. If you won’t be using them immediately, chill them in resealable plastic bags for up to 2 days. Step 1: Set a corn husk on a work surface, smoother side up (or hold it in your hand), and use a pastry bench scraper to smooth the masa on the corn husks. Step 2: Spread a layer of Chicken Salsa Verde Tamale filling and a nice big piece of cheese, now you are ready to start wrapping. Step 3: Place the point away from me, and roll the first side over the filling 1/2 way, fold up the point tip end, and then roll over to seam side down. Slip string under tamale and tie with a 16″ piece of string in a bow. Queso Fresco and Oaxaca are great to slice into sticks and as pictured above. I used Cacique Brand of Queso Fresco and Oaxaca available at Albertsons. Place a steamer basket in the bottom of the large stock pot, fill water just to the base of where tamales are placed, you don’t want the water on the tamales. Place a tight-fitting lid and steam for 1 hour. Tamalera pots are available just to steam tamales. My husband wants one because that’s how his Grandma cooked her tamales! I used a large Le Creuset Oval French (dutch oven) and a steamer basket. I did place the lid on while steaming and be sure to place the tamales open end up. Bring water to a boil and then reduce heat to medium-low for 1 hour. Add additional water as needed. Remove the string and corn husks, and top with your favorite salsa. True story, my Dad actually tried to eat a tamale with the corn husk!! We like to have our Chicken Salsa Verde Tamales with green and red salsa, looks pretty festive!!! I had never had a tamale before this one and the idea of making them from scratch was just intimidating. Your idea to have a tamale making party to motivate the effort was great so I invited some friends over recently and we had margaritas and made an afternoon of tamale making. Needless to say it was a hilarious adventure with a delicious outcome. Um, but thanks for that bit about your dad trying to eat the tamale with the corn husk on because a few of us were a little confused about that too. I’m definitely going to try the power of friends method on some other recipes I find scary. Very clever.